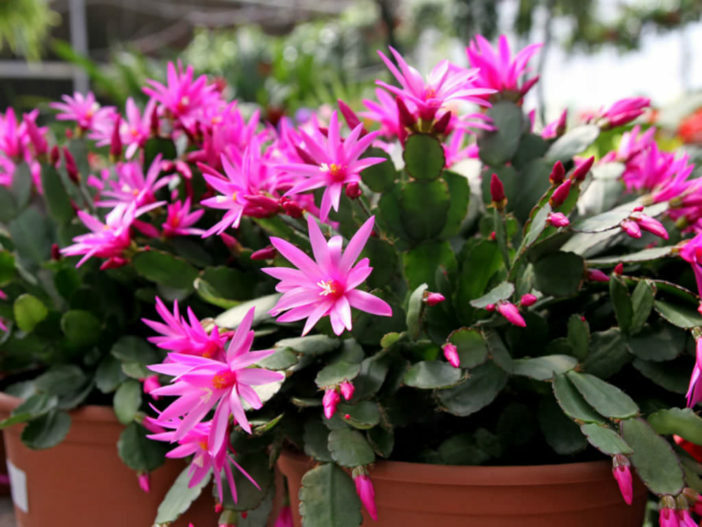 Many people don’t realize the flowering holiday plants they see around Christmas, Thanksgiving and Easter are cacti. They are the rain forest dwelling cousins of the well-known desert cacti. Although the two are closely related, successful growing of epiphytic cacti requires much different conditions than the desert cacti. Epiphytic cacti include those species in genera such as Acanthocereus, Disocactus, Epiphyllum, Hatiora, Hylocereus, Lepismium, Rhipsalis, Schlumbergera, Selenicereus and perhaps a few others. Understanding what makes epiphytic cacti special will help you make the best decisions concerning their care. They do not root in soil like many plants. Instead, they sprout in the crotches of trees or on large branches in rain forests, using their roots to cling tightly to their roost. Epiphytes have specially designed stomas or leaf openings, that allow them to absorb moisture from the air, keeping them hydrated as they dangle in the open air above the forest floor. Perhaps the most important aspect of epiphytic cactus care is the potting soil. Experts are strongly divided on the subject of using commercial cacti or orchid mixes, but they do agree that epiphytes need well-draining potting soil with lots of air space, since the roots would naturally be exposed to air. If you wish to create your own mix, start with a basic formulation of 60 percent potting soil to 40 percent perlite. Other amendments are often added, including peat, orchid bark, sand, fine gravel and leaf mold. Aim for a pH of 5.0 to 6.0 and plan to repot every 2 to 3 years if you use ingredients that eventually break down completely, such as orchid bark. Epiphytes do not exist in the open sun, instead receiving bright filtered light in most situations. They thrive as houseplants because of their relatively low lighting requirements. Ideally, you should provide full morning sun and shade for the rest of the day. An east-facing window with nothing blocking it can create these conditions. Light will affect the plant’s willingness to bloom, though these requirements vary widely between epiphytes. Many can be coaxed into blooming by simulating short days by placing them in dark closets for 12 or more hours at a time for 4 to 6 weeks. Water is crucial to your success with epiphytes. Unlike desert cacti, epiphytic cacti should be kept damp, but not soaking wet. Allowing them to dry slightly between waterings is also acceptable. Watering deeply once a week is often all it takes to maintain these conditions, though in hot, dry weather you may need to water more often. If the top 0.5 inch (1.2 cm) of soil is dry, it’s time to water regardless. During their dormant period, water epiphytic cacti just enough to keep them from drying out completely. Fertilize monthly while the cacti are actively growing using a complete fertilizer like a 20-20-20, mixed at half strength. Water with Epson salts mixed at a rate of 1 teaspoon per gallon once a month, but do not apply in the same week as complete fertilizer.